Crop Bistro & Bar offers a simple, approachable take on sophisticated fare. 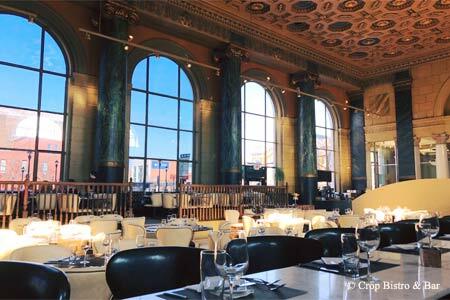 : Occupying two expansive floors, Crop Bistro & Bar is housed in a space reminiscent of NYC's Grand Central Station's Main Concourse with soaring ceilings, a glittery bar and an 18-person chef’s table that overlooks an immaculate open kitchen. This locale is close to Cleveland’s famous West Side Market, so expect lots of local ingredients and daily specials. The menu hints at culinary imagination with an interesting sense of whimsy without pushing the envelope too far. Start with the truffle popcorn or the cherry bomb, a clever combination of plum tomato, house-made chorizo and jack cheese wrapped in a wonton with smoky black beans. Mains are equally inventive: grilled veal chop over chanterelles with a truffled mushroom cream, or a Cornish game hen served with black and white quinoa and an heirloom tomato salad. For dessert, we suggest the black and blue, a dark chocolate ganache with blackberry purée paired with blueberry cream cheese ice cream. Cocktails are strong and creative, and the wine list is one of the area’s best.